What dessert do I bring to a patio BBQ? 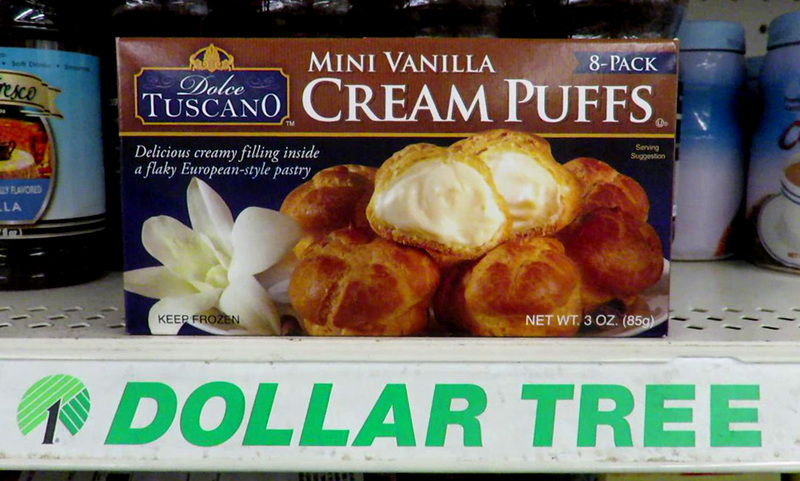 Well, I took a chance with Dolce Tuscano Miini Vanilla Cream Puffs that I bought for $1 at the Dollar Tree, down the street from my place. 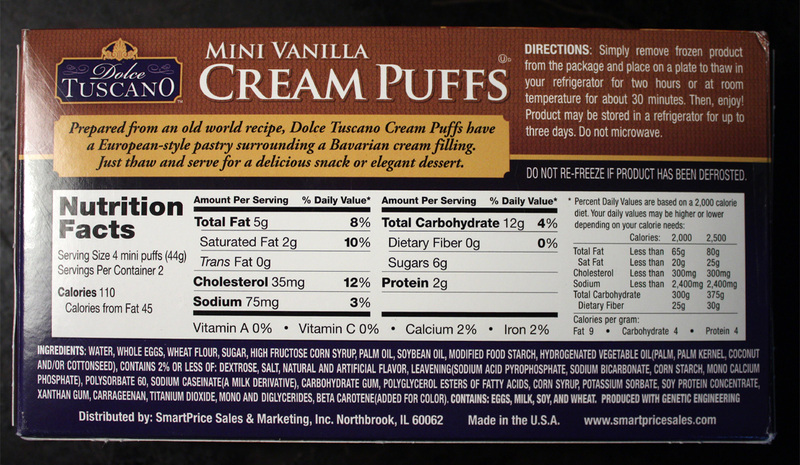 These confections reside in the frozen deli case, along with ice creams and frozen dinners. They are described as "Delicious creamy filling inside a flaky European-style pastry" - hey, they gotta be good enough for a party, right? 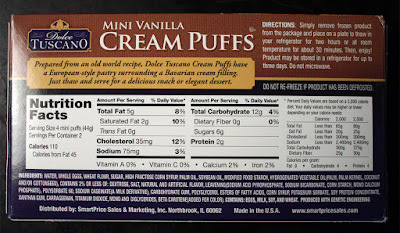 They needed defrosting, first, although I ate one that was semi-frozen, and liked it that way - the outer pastry was soft and the vanilla pudding inside was slightly frozen. 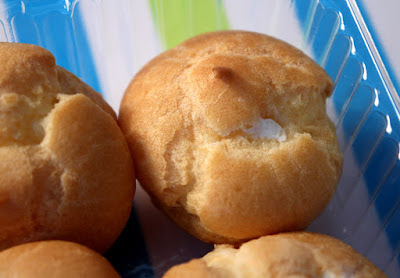 My neighbors were just starting to barbecue when I got there, so there was time for the Cream Puffs to finish defrosting. 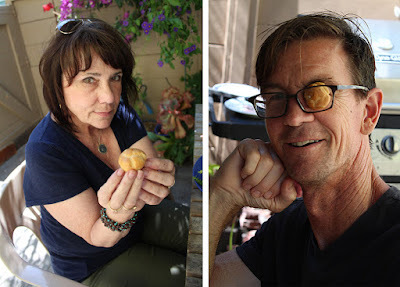 Normally I would not subject friends to my filming (yeah right,) but Bob and Anne were game and I thought it would be a nice change of scenery to let them share screen time with me, plus it's always interesting to show how tastes vary. But overall I was not too surprised at the Cheap$kate Dining rating numbers given in the range of 1 to 9, 9 being best. Bob and I were on the same page with an above average rating, while Anne liked the cream but dissed the pastry (see her revised rating* at end of this post,) thus dropping it a few points. I know what she means. The advertised flaky crust was not flaky, but slightly soggy -- that's the problem with frozen pastry desserts. So I can't really blame purveyor Dolce Tuscano too much for that, they're handicapped right off the bat. The pastry part was fine with a bread crust texture and taste, although slightly damp from defrosting. Maybe a solution is to make sure the pastries defrost out of the box so the moisture evaporates and the crust dries out. 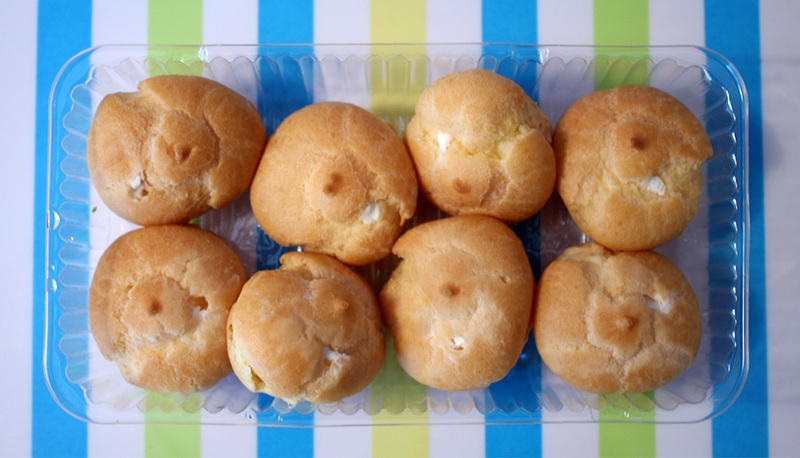 Everyone agreed that the creamy filling was the best part of this cheap$kate dessert. It's light and fluffy, not too heavy. The filling is very sweet with strong vanilla flavor. And the cream is a nice contrast to the pastry. You get 8 ping pong ball size pastries, so that's great value for a buck. The ingredient list is heavy on sugar, but it is a dessert. I have a comment on my YouTube channel that states they don't carry food items in their local Dollar Tree. 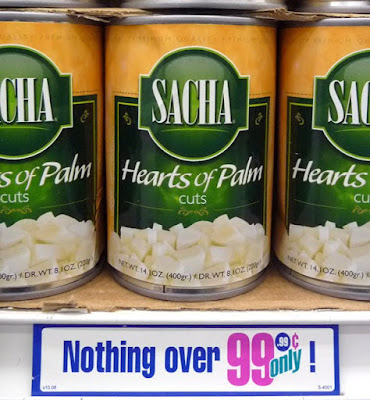 I think for Los Angeles the competition is fierce for 99c and dollar stores, so Dollar Tree has to up it's game here and stock more food items. My local one carries all manner of frozen veggies, chilled eggs and cheese, dried pasta, canned beans and pasta sauce -- all for a buck each. So how does my latest Deal of the Day rate to my guests, Bob and Anne? Well you will have to watch the video below to get their Cheap$kate Dining rating of 1 to 9, 9 being best. But I will give you my rating right now. I thought Dolce Tuscano Miini Vanilla Cream Puffs are a decent Deal of the Day and give them a rating of 6! I, too, take of a couple of points for the non-flaky crust, and blandness. Maybe a better defrosting technique is needed to improve the rating? But for a buck this is a good deal and I would serve them again for my next patio BBQ gathering. Play it here. Video runs 2 minute, 7 seconds. Dolce Tuscano is part of Smart Price food products. 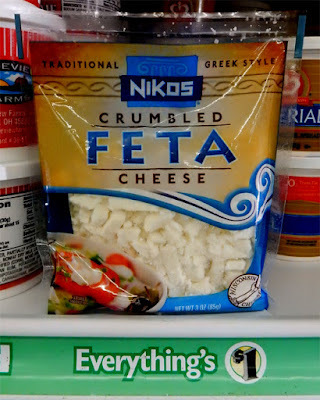 *Anne and I have exchanged a few Facebook posts and she actually has upped her Cheap$kate rating by a couple of points when I mentioned the pastries are kept fresh frozen in the deli case - not just set out on the grocery shelf forever, jacked up on preservatives. 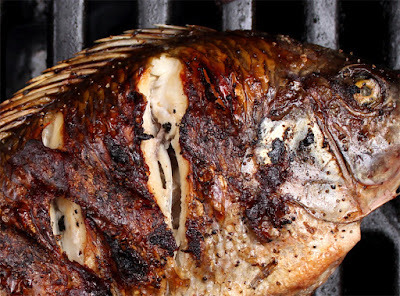 Summertime at the grill with a whole fish is quite easy to do. A whole fish does not fall apart easily, like a delicate fillet of fish. You do have those tiny bones to deal with, but if you take your time you will be rewarded with crunchy fish skin and tender flaky flesh. 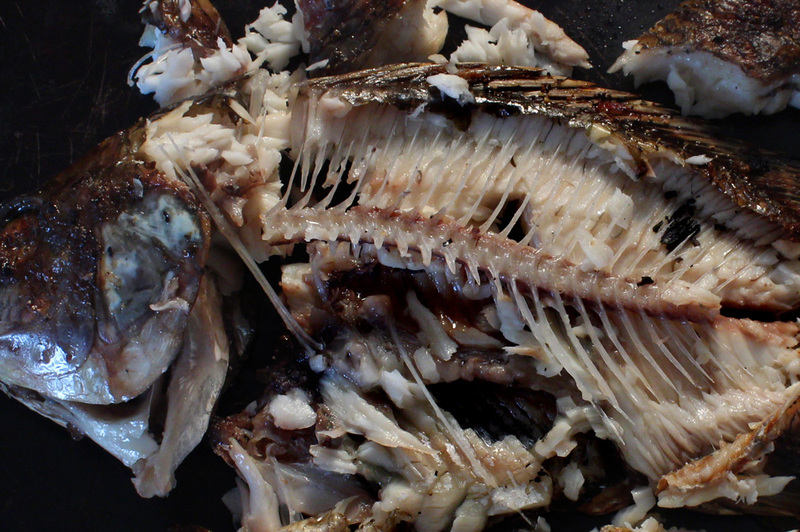 So check out my video recipe below for Grilled Fish, to bone up on how I do it. Play it here. Video runs 1 minute, 26 seconds. 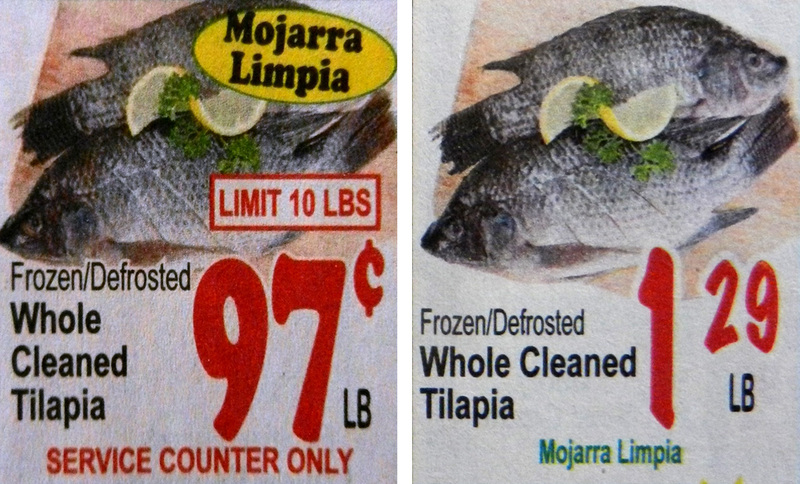 I usually get whole cleaned Tilapia fish from my local Latin grocery store for around 99 cents per pound. Of course you can use any fresh fish you catch. Most fish is sold with the fish scales removed. If you are not sure just take a spoon and rub the fish skin, in all directions, to see if any scales pop off. They are tough like fingernails so you want to give your fresh fish a quick check to make sure they are all removed. 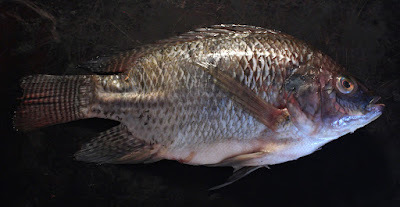 Be careful when handling a whole fish as their fins may have sharp bones that can easily pierce your fingertips. And if you are feeding the family, make sure to give the kids pieces of cooked fish that have been carefully checked for those pesky tiny fish bones. Before cooking whole fish give it a quick rinse before coating it with any seasonings or marinade. I keep it simple, just rub on a little olive oil, salt and pepper. If you have any favorite herbs then feel free to sprinkle them on, or add a few sprigs into the fish stomach cavity. I grill with cheap Tilapia fish, but you can use any locally caught fish, or fish from a farmers market. 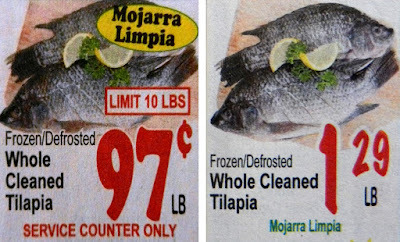 Any defrosted fish you buy should be cooked within a day or two, at most. Fresh fish is extremely perishable so get to cooking it soon. Fish on a grill cooks fast, so don't walk away for too long to refill your glass of wine or retrieve another can of beer. 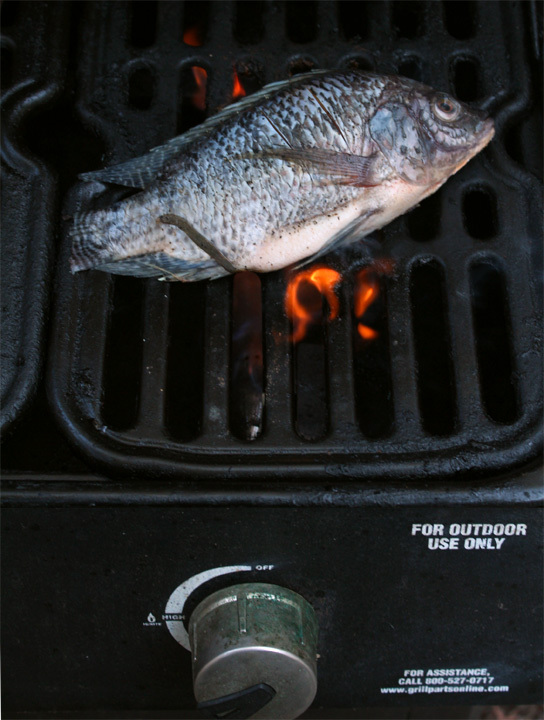 I use a gas grill and the heat is controllable, but if you are using a charcoal grill you can cook the fish off to the side - it's easier to monitor that way. You can oven-broil a whole fish too, just keep an eye on it. 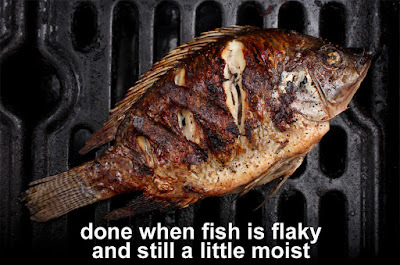 Fish is done when it's flaky and firm, but still a little moist. It's always okay to break off a piece of fish to taste for doneness. I like to cook fish with skin on. Some Japanese restaurants even serve grilled fish skin as a special appetizer. For thick and meaty fish cutting a few slices into the thickest part will make a more even doneness - it's also easier to flake off a small piece of flesh to test. 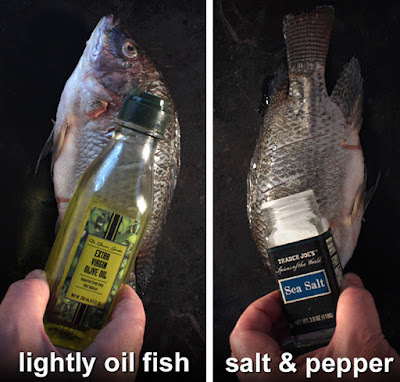 If a whole fish is thin then just oil and season it, and start grilling. My recipe is delish however you slice it! If you buy fish fillets on sale they need to be handled carefully over an open flame. Make sure to oil the grill or the fillet, so the fish will not stick and fall apart when you turn it. I like whole Grilled Fish because it's quick to do, but oh so tasty. Just remember to watch out for those tiny bones, it's well worth picking around to get to all that smoky grilled seafood goodness. 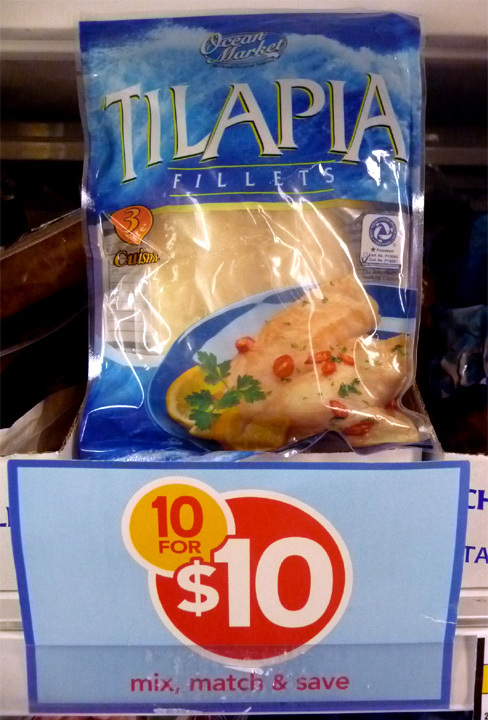 1 whole fish - I used a cleaned tilapia fish. Okay to use any local caught fish or fish fillet. 1 tablespoon oil - I lightly coated the fish. Okay to just add oil on the grill. Salt and pepper to taste - okay to use favorite seasoned salt. Check fish for freshness. It should not smell off - just a clean fish smell. Fish skin is shiny and not over-slimy. Fish eyes are mostly clear, not too cloudy. Go by look, smell and feel - hey, it's a fish so there will be some smell and sliminess, just not too much. Also check that the fish belly is cleaned out. Sometimes there are small bits of stomach or intestines left, just pull out any leftover pieces. I also rake a spoon edge over the fish skin - sometimes a few fish scales are still attached. They will come loose when you rub the spoon over skin, but you need to make sure to rub skin from tail-to-head direction. Scales will fly off, so place fish on large plate or a sheet of newspaper, or on a bag. Okay, now time to get the fish on the grill. 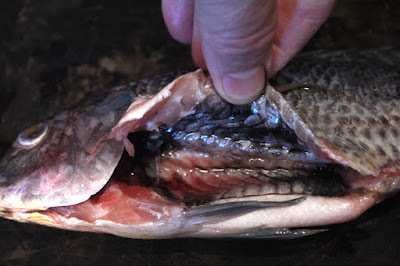 If the whole fish is a big one, then make a few slices into the thickest part of fish, this makes it easier to check for doneness. Also the fish will cook more evenly. 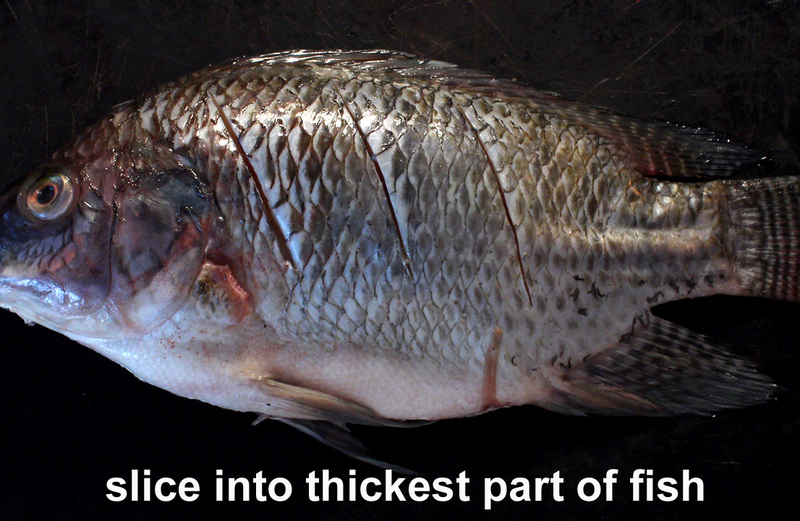 Some fish has a thick side and a thin side; you only need to slice into the thick side. Some fish is thick on both sides so slice away. Once you've grilled fish a few times, you can grill it without the slices, just go by touch - fish is done when it is firm to the touch. 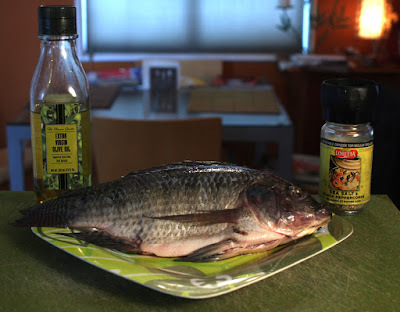 I prepare my whole fish simply, just a little olive oil, salt and pepper - that's it. You can brush on a little of your favorite oil or just drizzle and rub it all over the fish. When fish is oiled, sprinkle on a little salt and pepper. For a lighter version leave off the oil and just add some to the grill where the fish is cooked. Adding oil to the fish keeps the flesh from sticking to the hot grill grating. You can also sprinkle on any favorite herb, or add a few sprigs into the belly cavity. If you have a favorite marinade you can use it. 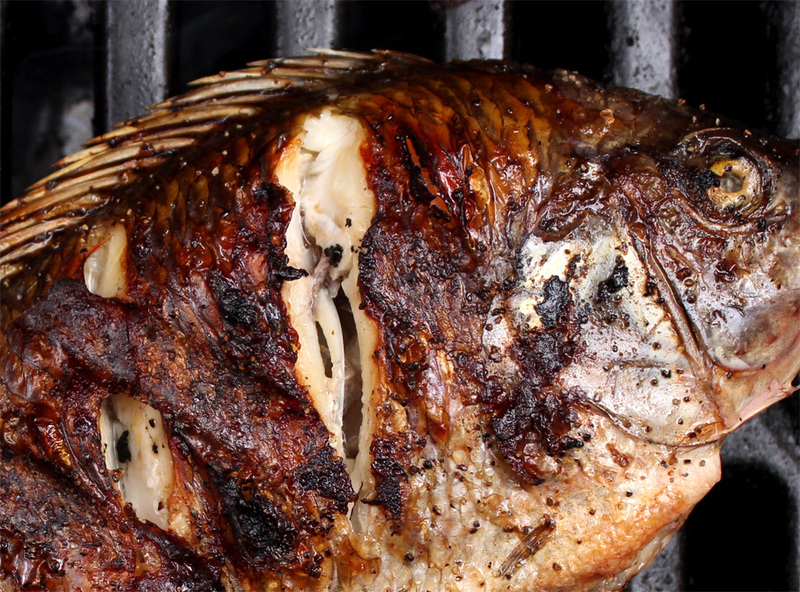 Heat up the grill and when it's hot add the oiled and seasoned whole fish. Cooking time will vary, depending on the thickness of the fish and how hot the grill gets. My whole tilapia took about 3 minutes for each side. It's easy to overcook fish, so you want to check on it often, at least every minute or two. When fish goes from semi-transparent to a solid color, then it is done. You can always break off a piece of fish to test by tasting. Since fish cooks quicker than chicken or steak, it's best to have all your side dishes set out and ready to serve when you (wo)man the grill. There is no real expiration date for my latest Deal of the Day, Gossner's U.H.T. Shelf Stable Milk, that I retrieved not from a refrigerated cold case, but from a regular room-temperature grocery shelf. I have seen this type of milk for a while now, but I never picked up a carton - until this year when I started seeing these cardboard packages in my local Dollar Tree. Milk is extremely perishable so I stayed away from it. But at a buck for a quart of milk I thought, why not try it now? Hey, it's just regular milk that is heated to 282 degrees and held for several seconds, then cooled to 70 degrees in a continuous pressurized system. Basically the milk is overheated for extra shelf life, and can be stored at room temperature until you open the box. 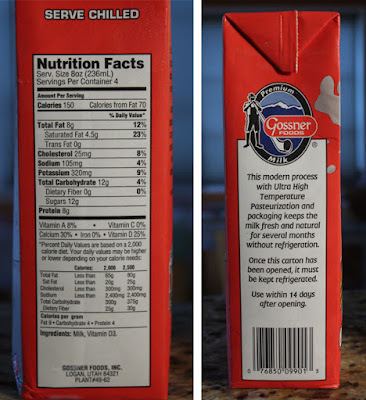 Once opened, the milk carton should be kept in the refrigerator, like regular cold milk from a cold deli case. This milk has no preservatives or artificial hormones, it's just plain milk. You can read all about their treatment process by clicking here. 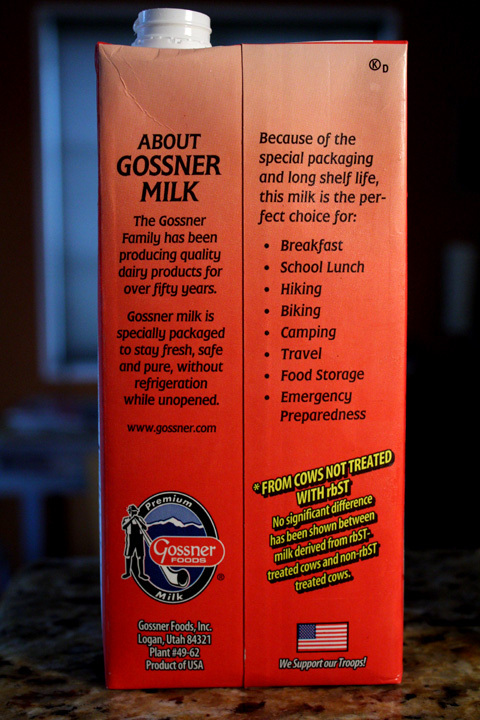 And the dairy producers Gossner, have been around since the 1940's and specialize in Swiss cheese. Upon developing their special heating and room temperature storage process, they now supply the military with milk. As you can imagine, this type of milk travels well on family vacations. And living in Los Angeles, I would add this milk to my emergency earthquake kit, too. But the main question is, how does this milk taste? Once the milk is chilled there is no discernible difference. I have tried Gossner's 2% and whole milk, and they taste fine and rich enough. I mainly just add it to coffee and hot oatmeal. I like that you can get a couple of cartons at a time, one to use and one to store, so you never run out during caffeinated mornings. So how does Gossner's U.H.T. Shelf Stable Milk rate on my Cheap$kate Dining Scale of 1 to 9, 9 being best? It tastes as good as regular milk so I have to give it a perfect 9! 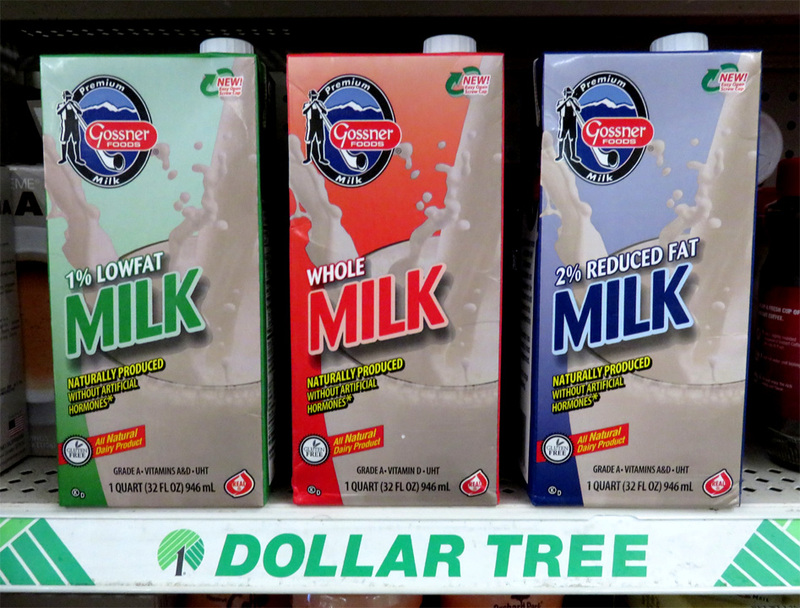 Go ahead and make the plunge next time you see this type of milk on your regular grocery shelves -- you can't beat the dollar price tag. 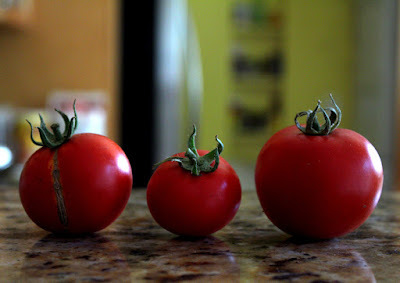 Here are my first tomatoes of the season - right off the vine. 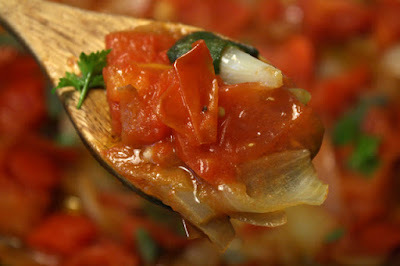 I like to serve them uncooked, when the tomatoes are at maximum freshness and most juicy. This is when you taste all the flavor a tomato has to offer. This cheap$kate gardener seldom has a bumper crop, but the ones I pick will be put to delicious use. If you don't have a garden, maybe you have a generous neighbor, a local fave farmers market, or if you are on the road and just pull over into a roadside veggie and fruit stand with a hand painted tomato sign. 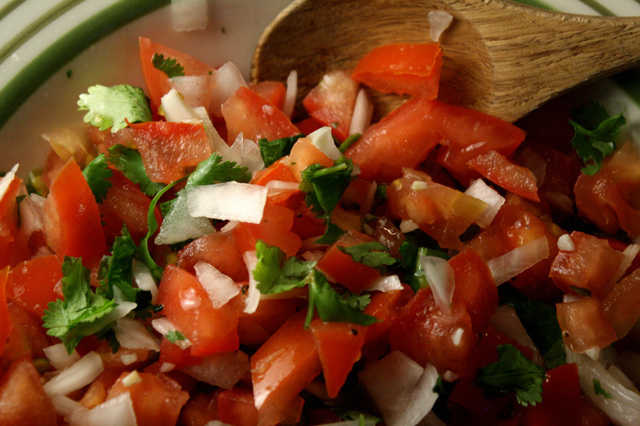 So read on for the freshest tomato recipes that are just a slice away. And click on any recipe name to be directed to my blog post for the complete recipe text with photo illustrations. For a fresh garden tomato just simply slice it and add a couple more ingredients. My favorite recipe is for a Caprese Salad that's composed of fresh mozzarella, a few basil leaves, salt, olive oil and of course, thick slices of fresh tomato. Arrange the parts on a plate and serve at room temperature. Set out a plate for your guests, and be sure to have a couple bottles of wine ready to pour. An Italian version of salsa on tortilla chips, are lightly marinated chopped tomatoes served on wedges of toast, that's called Bruschetta. Serve it as a crunchy appetizer. Salads and large chunks of sliced homegrown tomatoes belong together. Go light on the salad dressing though, because you want that fresh tomato flavor to come through clearly. A Warm Corn, Tomato & Cilantro Salad is a simple side dish to make. 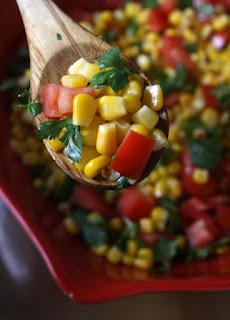 It's okay to use always cheap, fresh, frozen or even canned corn. I have a 2 Minute Salad made with easy-to-get ingredients, including canned chicken (okay to substitute canned tuna,) spinach, canned beets and tomato. 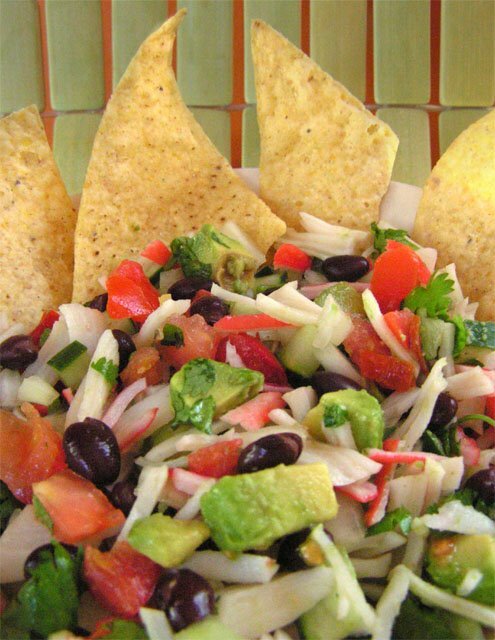 This cheap$kate salad travels well and can be quickly put together for lunch at your workplace. 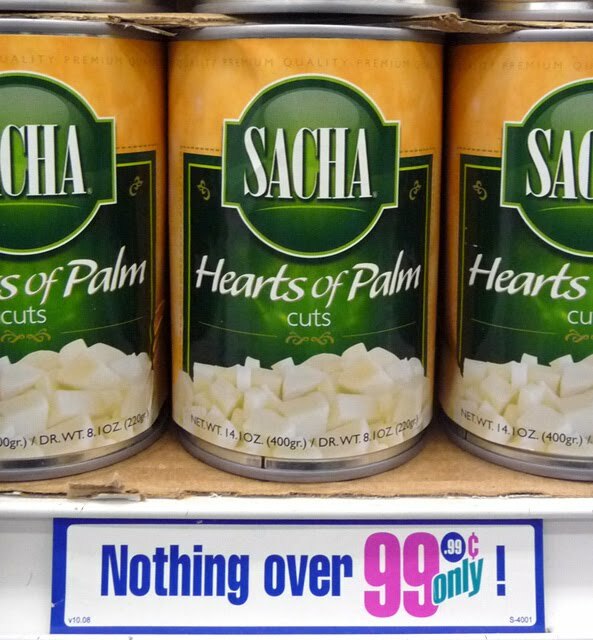 My most unusual salad uses canned hearts of palm. 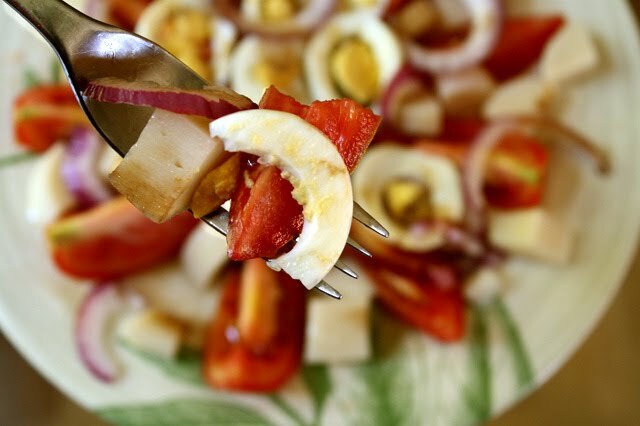 I came up with Hearts of Palm Salad - Brazilian Style, because I keep seeing the mild tasting main ingredients on sale at my local 99c only Stores. If you have never tried heart of palm, then break yourself in with this fresh salad idea. Another salad takes the crown for Best Classic Salad, my version of a Crab Louis Salad. 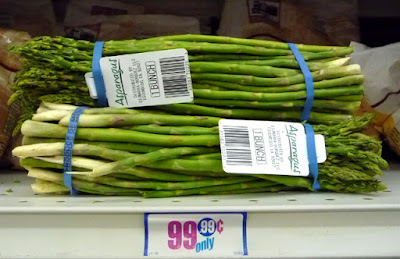 While expensive ingredients are called for, I have found asparagus frequently on sale, and I use cheap fake crab, or krab. Of course, if you are cooking to impress then use real lump crab meat. 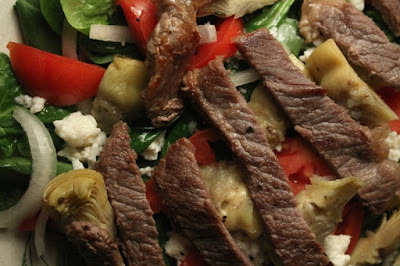 Sauteed sliced steak, or feta cheese, on a salad needs a strong flavored tomato, and a garden tomato is up for the job in my Warm Steak and Armenian-Style salads, that feature pungent feta cheese. Italian pasta sauces will not be much improved upon with a fresh garden tomato. However the exception is my Rustic Tomato Sauce with Pasta. 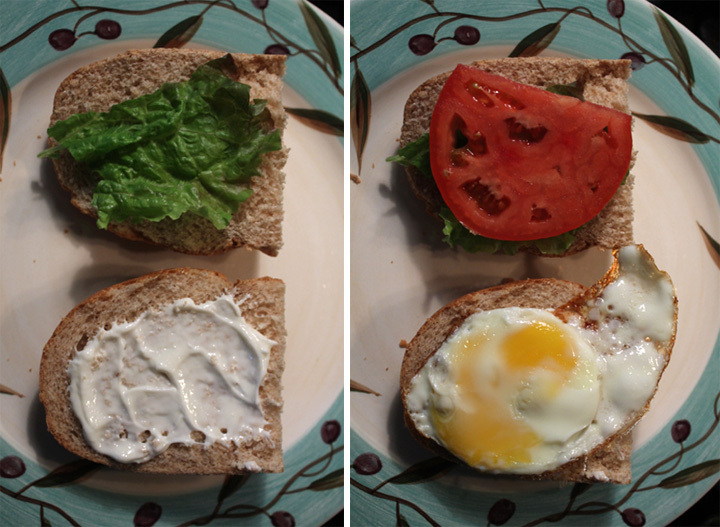 The fresh tomato is added at the last minute and only cooked until it starts to collapse, but still at peak flavor. 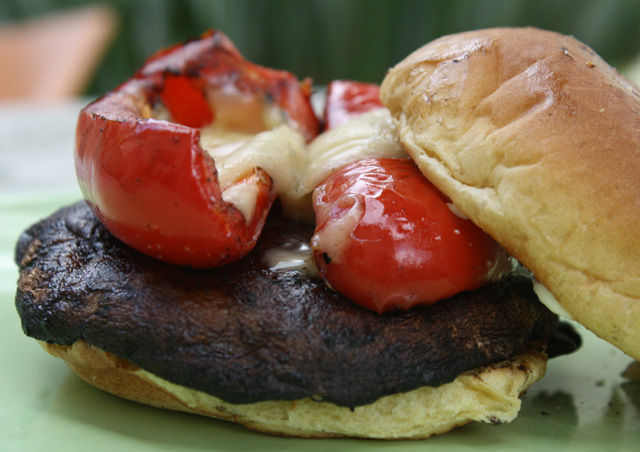 A big fat tomato slice is what every sandwich requires, at least in my recipe book. 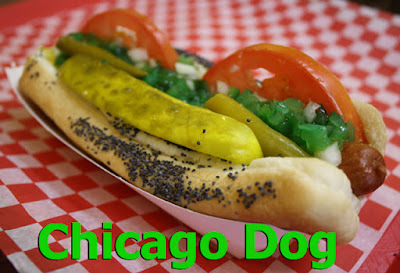 I like tomato on my Breakfast Egg Sandwich, and even a wedge of tomato nestled in my Chicago-style Hot Dog. 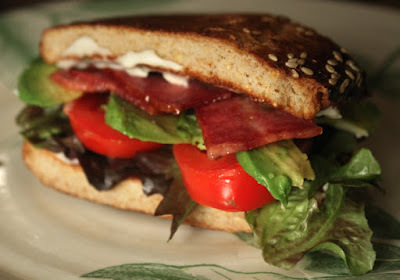 For a Bacon, Lettuce and Tomato Sandwich, you gotta have a good tomato. 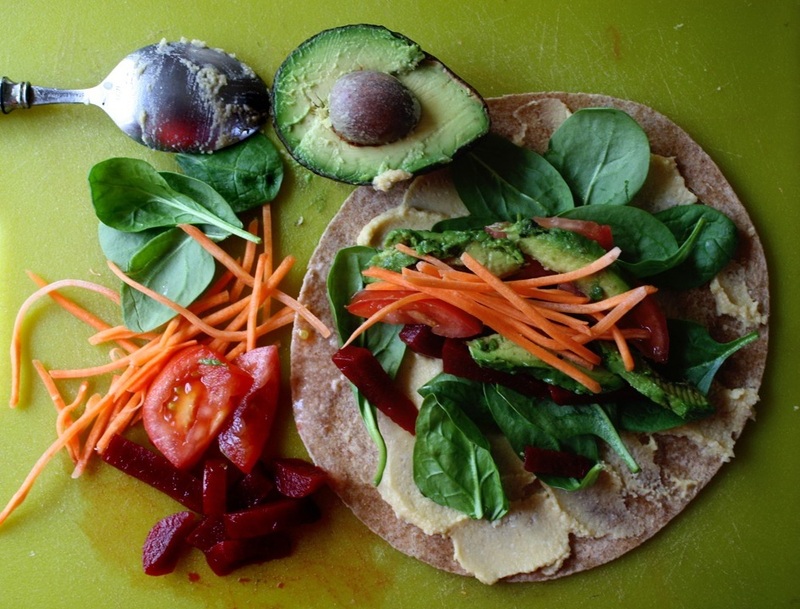 I kick my BLT up a notch with the addition of avocado. For my vegetarian visitors add tomato to my delish grilled Portabella Mushroom Burger, or a Veggie Wrap with Hummus. A Summer Ceviche made with krab, drained black beans, cucumber, tomato, onion, cilantro and creamy avocado is my go-to patio party starter. 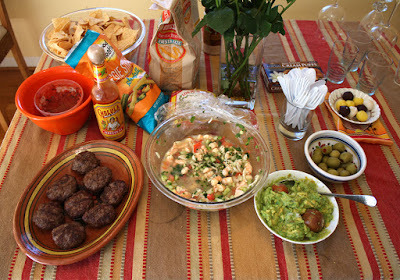 Set out a big bowl of chips to scoop up my cool Krab Ceviche. And be sure to have some picante hot sauce at the ready. I'll leave you with a bit of cheap$kate comedy about my video visit to a local garden nursery for free noshing on fruit picked fresh from the vine, including a beefsteak tomato. Bon appetit !